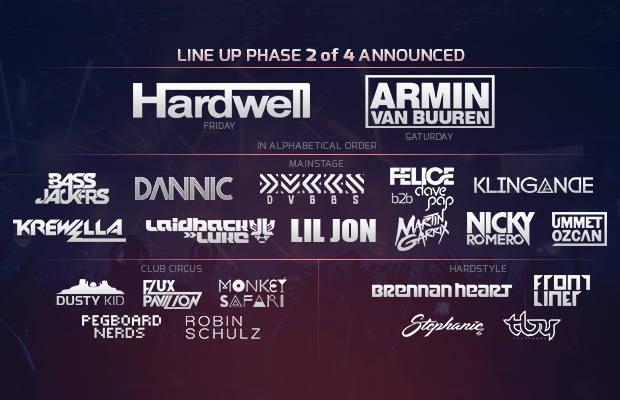 Already creating buzz with the first phase of their 2014 line up including the announcement of ace acts Armin Van Buuren, Nicky Romero and Martin Garrix, Electric Love continues filling their artist roster with the creme de la creme of the electronic dance music industry. Therefore hopping on board to strengthen the team of performers at the second run of the three-day festival are none others than No. 1 DJ Robbert van de Corput alias Hardwell, highly acclaimed Dutchman Laidback Luke, Chicago-based power trio Krewella, American rapper Lil Jon, Brennan Heart, Frontliner, Robin Schulz, Pegboard Nerds, Dusty Kid and Monkey Safari as well as the festival’s residents Felice & Pap. With four of their ticket categories being already sold out, Electric Love is suspected to reach even higher levels this year. Note that discounted tickets are only available until February 28th. So save your tickets now at www.electriclove.at/de/revolution-tickets! 3-Day-Festival Pass / No Camping incl.